Well appointed home for sale! One of the best properties on the market, this Pool Villa offers you extraordinary luxury and top quality. 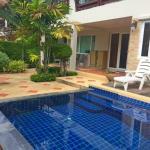 Luxury trendy villa for sale at Mabprachan lake ! !